Veteran Classic-winning trainer John Dunlop is to retire at the end of the Flat racing season in November. The 73-year-old won the Epsom Derby twice - with Shirley Heights in 1978 and Erhaab 16 years later. Dunlop, who is based at Arundel in West Sussex, also trained three winners of both the St Leger and 1000 Guineas, plus the Oaks twice. "I now have much-reduced stable numbers and it is now less viable than it once was," he said. Dunlop saddled more than 3,000 winners, including Moon Madness (1986), Derby runner-up Silver Patriarch (1997) and Millenary (2000) to win the St Leger while Sakhee was second to Sinndar in the 2000 Derby. His 1000 Guineas winners were Quick As Lightning (1980), Salsabil (1990) and Shadayid (1991), while Circus Plume (1984) and Salsabil (1990) won the Oaks. 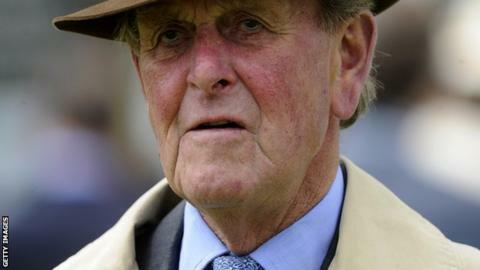 Former top jockey Willie Carson, who rode hundreds of winners for Dunlop including Erhaab in the Derby, said: "He is one of the true legends of the sport. "He's a gentleman who everyone in racing has tremendous affection for." Dunlop's sons Ed and Harry have both become successful trainers, with Ed enjoying Classic successes with fillies Ouija Board and Snow Fairy.